Pay with your Points or Miles. Turn all your spending on your Citi Credit Card into rewards you love. Earn enticing rewards for spending on your Citi Credit Card. Whether it's redeeming Points or Miles to offset purchases or getting cash rebates, choose what you love from a variety of rewards through our wide selection of participating merchants. 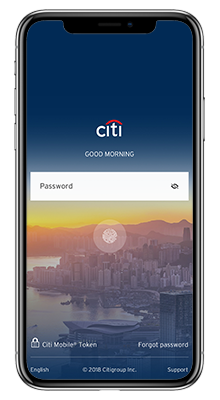 Step 1 Login Citi Mobile® App. Step 2 View and select any transaction under the list of transactions made on your Citi Credit Card. Step 3 A "Pay with Points" or "Pay with Miles" button will be available for eligible transactions. Click on the respective button to proceed. Step 4 Review and confirm the total number of Points/Miles to be redeemed and click on "Pay with Points" or "Pay with Miles". Step 5 Upon confirmation of successful redemption, a statement credit will be reflected in your next statement of account. You can select up to another 5 transactions to redeem with Points/Miles. Pay with Points Online is also available via Citibank Online. Click here for Citi Pay with Points full terms and conditions. Step 1 Download the latest AXS m-Station mobile app. 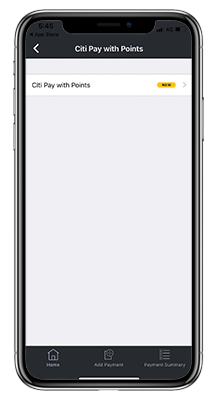 Do ensure to secure with a passcode when you log in. Step 2 Go to the main navigation on the top left and select Settings -> Manage Payment Modes -> Pay with Credit Card Points -> Citi Pay with Points. Step 3 Enter the last 4 digits of your credit card number and full mobile number, verify your OTP and you will be successfully enrolled. Step 4 Pay for your bills, fines, top-ups or any other services available on AXS. Step 5 After successful payment of an eligible transaction, your Points/Miles balance will be shown with the number of Points/Miles required to redeem. Step 6 Enter the redemption amount, click on "Redeem" and your transaction is redeemed! Note: Citi Pay with Points redemptions are not applicable for credit card bill and loan repayments bill payments. 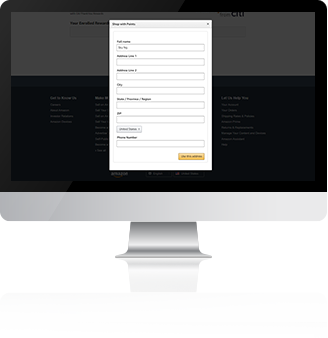 For more detailed enrollment and redemption flows of merchants, click here to find out more. Click here for Citi Pay with Points Program full terms and conditions. Step 1 Pay for your purchases with your Citi Credit Card. 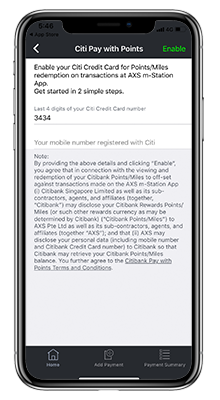 Step 2 An SMS will be sent to your mobile phone number registered with Citi with a link for you to redeem your Points/Miles/Rebates. Step 3 Click on the link and select the number of Points/Miles/Rebates to redeem. Step 4 Upon confirmation of successful redemption, a statement credit will be reflected in your next statement of account. Pay with your Citi Credit Card and use your Points/Miles/Rebates to offset your transaction at our participating merchants. Step 1 Pay for your purchases with Samsung Pay. Step 2 Click on "Citi Pay with Points" notification. Step 3 View & choose to redeem from the latest 10 transactions made in the last 30 days. Step 4Click on "Redeem Now" to proceed. Step 5Upon confirmation of successful redemption, a statement credit will be reflected in your next statement of account. Start redeeming and save on fashion, dining, travel and more now! Redeem S$50 Voucher with 22,000 Points or 8,250 Miles. At all Shell stations in Singapore. *Please note that miles earned on the Citi PremierMiles American Express Credit Card will not be eligible for Citi Instant Rewards. 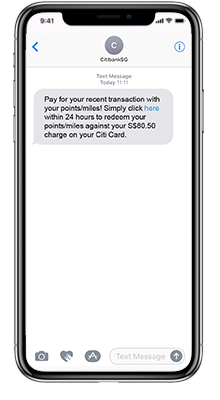 Redeem for cash rebate using your Points or Miles with just a simple SMS. Your Cash Rebate will be credited to your credit card account instantly! Points refer to the Points earned on your credit card account. Miles refer to the Miles earned on your credit card account. Click here for Citi Cash Rebate SMS full terms and conditions. 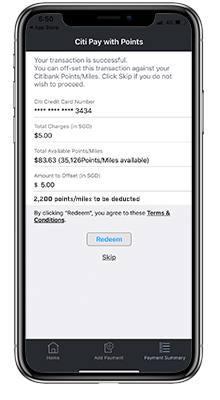 *Please note that miles earned on the Citi PremierMiles American Express Credit Card will not be eligible for Citi Cash Rebate. Pay less for your Amazon purchases when you checkout with Citi Points and Citi Credit Cards instantly at Amazon.com. Simply enroll in Shop with Points to get started. Shop with Points at Amazon.com. Click "Get started" button in the blue box on the top right. Click "Enroll a new card" button. Key in your card information, followed by Postal Code which should be the same as your Citi Credit Card billing address. You will get a confirmation email upon successful enrolment. Discover a world of rewards with your points or miles. With Citi ThankYou SM Rewards, you can now choose to shop & redeem for an incredible selection of merchandise from many of the world's leading brands, to redeem for gift vouchers, as well as enjoy savings when you redeem for exciting travel destinations. What is Pay with Points? Pay with Points is an instant gratification channel for rewards redemption where Cardmembers can choose to pay for their purchase with their Points/Miles to enjoy savings. Upon confirmation of successful redemption, a statement credit will be reflected in Customer's next statement of account. 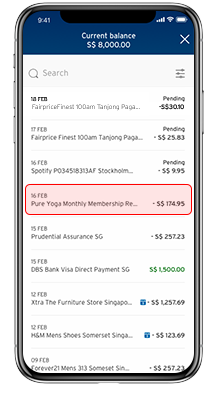 Customer is requested to review the redemption details and clicks on "Pay with Points Now"
Statement credits are refunded back to the statement and points are deducted. Customer is able to select "Pay More Transactions with Points" and select multiple transactions to redeem thereafter. 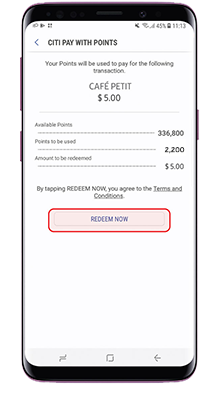 Customer is requested to review the redemption details and clicks on "Redeem"
Customer clicks on "USE YOUR POINTS/MILES" at the bottom of the page. 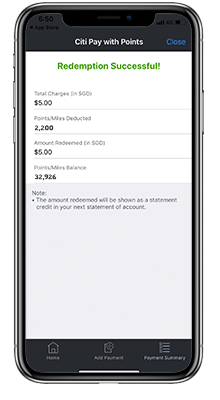 Statement changes to "Pay with Points" and customer is able to select individual or multiple transactions to redeem for and clicks "Continue"
Customer is requested to review the redemption details and clicks on "Continue"
On the click of the notification, the Samsung Pay mobile app will be launched and customer will be brought to their card details page where they can choose to redeem the transaction using Points/Miles (customers are able to view latest 10 eligible transactions in the last 30 days). Customer selects which transaction to redeem and will be brought to a pre-confirmation page where they are asked to confirm the redemption details as well as general T&Cs. After clicking "Redeem Now", a confirmation page will show. Statement credits are refunded back to statement and Points/Miles are deducted. What transactions are eligible for Pay with Points? 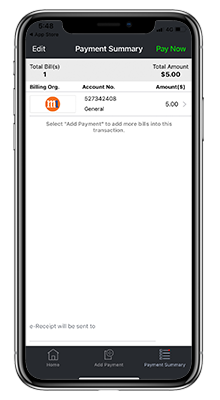 Eligible Transaction refers to the charge of Cardholder's purchase at Participating Merchant to a Citi Card, where the description of the transaction posted to the Cardholder's Citi Card contains the Participating Merchant's name. Eligible Purchases are retail purchases made using your Citi Card within 60 days of a Points/Miles redemption date. Temporary authorizations are not eligible for redemption under the Pay with Points service. A "retail purchase" means a purchase of any goods or services by the use of the card and may, at our reasonable discretion include or exclude any card transaction as may be determined by us. Retail purchases exclude annual cardmembership fees, interest, late payment charges, GST, cash advances, easy/ extended payment plans, income tax payments, bill payments (for example, payments via Citibank Online or via any other channel or agent (such as a third party agent for payment of bills) whether for bill payments or otherwise) and any other form of service / miscellaneous fees and such other transactions excluded from earning Points/Miles as set out in the relevant cardmember's agreement applicable to your Citi Card. 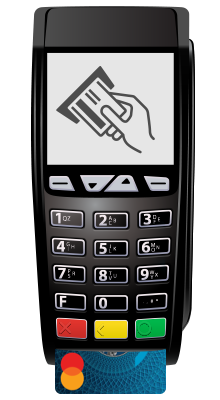 Eligible Pay with Points via Merchants transactions are purchases made through a participating merchant that accepts Pay with Points as a form of payment. For the list of participating merchants, please click here to find out more. Eligible Transaction refers to the charge of Cardholder's purchase at Participating Merchants to a Citi Card, where the transaction is made with Samsung Pay and you have the required Points/Miles for redemption. Participating Merchants refer to the merchants that accept Samsung Pay as a form of payment. Who is eligible to use Pay with Points? Pay with Points SMS feature is available to Principal Cardholders of a Citi Credit Card that is active and in good credit standing. 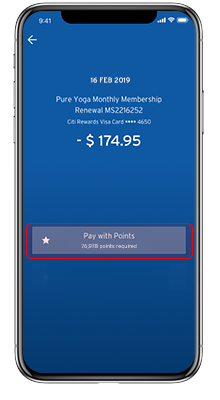 Pay with Points Online feature is available to Principal Cardholders of a Citi Credit Card that is active and in good credit standing and must be enrolled for Citibank Online or Citi Mobile® App. Pay with Points via Merchants feature is available to Principal Cardholders of a Citi Credit Card that is active, in good credit standing and has successfully done a one-time enrollment with the specific participating merchant. 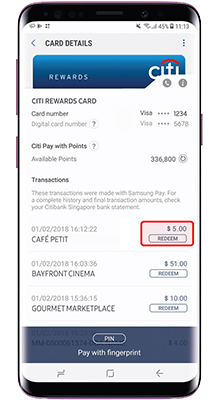 Samsung Pay – Citi Pay with Points feature is available to Principal Cardholders of a Citi Credit Card that is active and in good credit standing. Can I use Pay with Points for a transaction if I don't have enough Points or Miles to cover the entire purchase? Yes. However this is only applicable for Partial Redemption, while meeting the minimum transaction amount customer can redeem. No. Pay with Points Online is only available for full redemption for the full transaction amount. Yes, however this is only applicable for Partial Redemption, while meeting the minimum transaction amount the customer can redeem (will be shown an error message if amount redeemed is below the minimum). No. 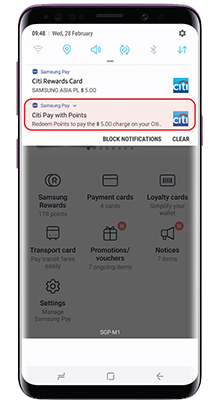 Samsung Pay – Citi Pay with Points is only available for full redemption for the full transaction amount. 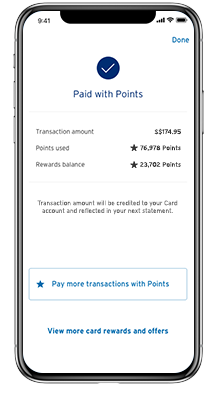 What happens if I redeemed my Points or Miles for a statement credit using Pay with Points SMS, Pay with Points Online, Pay with Points via Merchants or Samsung Pay &dash; Citi Pay with Points then returned the purchase to or raised a dispute with merchant? In case of merchant disputes, and in the event that a transaction is reversed by a merchant, the dollar transaction amount of the transaction, and not the Points/Miles used to pay for the transaction, will be credited back to your statement of account. Do I still have to make the required minimum payment on my credit card account if I receive Pay with Points SMS, Pay with Points Online, Pay with Points via Merchants or Samsung Pay &dash; Citi Pay with Points statement credits? Yes, the required minimum payment reflected on your credit card statement must be paid in accordance with your Citi Card Agreement. Do I still have to make the full payment on my credit card account if I receive Pay with Points SMS, Pay with Points Online, Pay with Points via Merchants or Samsung Pay &dash; Citi Pay with Points amounting to my current month's outstanding amount payable? Yes, the full payment amount reflected on your credit card statement must be paid in accordance with your Citi Card Agreement. The Pay with Points statement credits will be reflected in your following month's credit card statement. 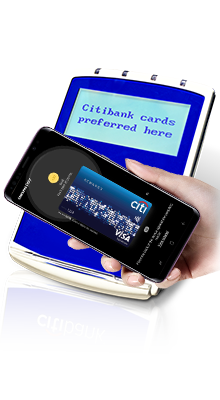 Can Citibank Debit cardholders enjoy the privileges of Instant Citi Rewards? No, only Citibank Credit Cardholders can enjoy privileges of Instant Citi Rewards programme. Will my Points/Miles balance be transferred to the new card should I lose OR upgrade my card? Yes, Points/Miles will be transferred to the replaced /upgraded card. Can supplementary cardholders redeem Points/Miles? Are there more than 1 ways to redeem instantly? 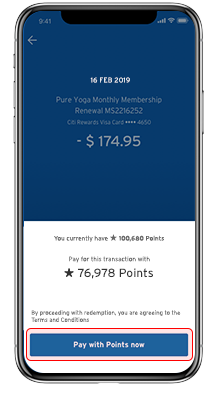 a) Cardmembers redeem their Points/Miles at point of purchase to offset their purchases immediately. b) For some merchants like shopping malls, cardmembers can redeem mall vouchers at the customer service counters. Since there is no retail transaction at the customer service counters, cardmembers will redeem their points and vouchers from that merchant will be presented to the cardmember. The voucher can then be presented at check-out to offset your purchase. *Please note that T&Cs and date of expiry of the voucher is determined by the mall management. It is usually indicated at the back of the voucher and is not up to Citibank's decision to extend expired vouchers. Please contact the mall/merchant directly if your vouchers have expired. Can I cancel my redemption made? No, all redemptions are irrevocable. Once the redemption has been submitted, the redemption cannot be reversed, cancelled or changed and the Points/Miles cannot be transferred back to your Points/Miles Balance. 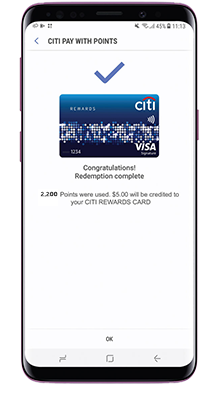 What is Citi Rewards SMS Cash Rebate? It is a service that allows you to redeem cash rebate in blocks of $10, $20 or $50 using your Points/Miles. Upon successful redemption, the cash rebate will be credited to your credit card account immediately. What are the cards eligible for this SMS redemption? This service is available to all Citi credit cards earning Points/Miles - such as Citibank Classic, Gold, Platinum, Ultima, Prestige, Business Gold Visa, Clear Visa, Clear Platinum, Citi Rewards Visa Signature, World Mastercard, Citi PremierMiles Visa. Cash Rebate is not eligible for Citi Cash Back and Citi PremierMiles American Express and Citibank Co-branded cards. Can supplementary cardmembers perform the SMS redemption? This service is not applicable for supplementary cardholders. What are the available cash rebate amounts? Cash rebate is available in blocks of $10 for 4,400 Points/1,650 Miles, $20 for 8,800 Points/3,300 Miles and $50 for 22,000 Points/8,250 Miles. There is no limit to the amount you can redeem. The amount of cash rebate you can redeem is based on the available Points/Miles. Is the Cash Rebate transferrable to another card account? No. Cash Rebate is not transferrable and will be credited to the credit card that you redeemed from. How do I redeem beyond the available cash rebate amount of $10, $20 and $50? Are there charges to use this service? This service is currently offered free of charge but you may incur SMS charges from your mobile operators. How can I confirm if my request is successful? An SMS reply will be sent to you upon the successful redemption. Your credit card available balance will be adjusted accordingly to the amount you have redeemed for immediately, and you can view the statement entry reflected in your account, two days after the SMS redemption is made. Please login to Citibank Online to view or you may call in to the 24 hour Citiphone banking to enquire. I've received an error/rejection message for the SMS redemption. c) Your mobile number may not be registered with the bank. - Please call our 24 hour CitiPhone hotline at 6225 5225 to update your mobile number. I am currently located overseas and would like to perform an SMS cash rebate, am I still eligible? Yes, you can make SMS redemption while overseas. Please send the SMS from your mobile phone number registered in Citibank's records. Do note that you may incur overseas SMS charges, please check with your mobile operator for more information. For Points/Miles balance enquiry SMS to +65 9657 2484: RWDSBAL<space>Last 4 digit of card number. Shop with Points allows customers with an eligible Citi credit card to use available Points/Miles for eligible purchases at Amazon.com. What is an eligible Citi credit card? An "Eligible Citi credit card" means the Citi Platinum, Citi Rewards, Citi Clear Platinum, Citi Gold, Citi Classic, Citi Clear Classic, Citi Clear, Citi PremierMiles, Citi Business, Citi Corporate, Citi Prestige and Citi ULTIMA Cards issued by Us. How do I link my eligible Citi credit card to my Amazon.com account so that I can shop with points? Linking your card accounts is easy. 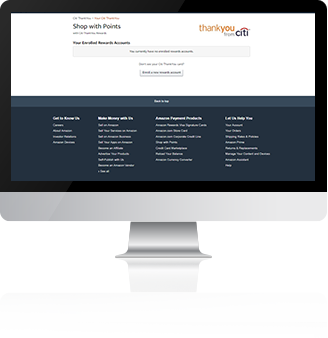 Simply link your card accounts by visiting the ThankYou Rewards page at Amazon.com and clicking the Get Started button in the blue box on the top right. From there follow the online instructions to link your card accounts to your Amazon.com account. Can I allow my card Account to be linked to my family members' respective Amazon.com accounts? Yes. Your card Account can be linked to multiple Amazon.com accounts. For the avoidance of doubt, if you allow your card Account to be linked to multiple Amazon.com accounts, the respective Amazon account holders will be able to make purchases on Amazon.com using your available Points/Miles in your card account, your eligible Citi card itself, or a combination of both. By allowing your card account to be linked to multiple Amazon.com accounts, you will be deemed to have authorised all Amazon.com transactions effected on your card account regardless of the Amazon.com account used to make the purchase. Will I be notified if my card account is linked to an Amazon.com account and if a transaction has been made at Amazon.com using my available Points/Miles and/or my card? Yes. 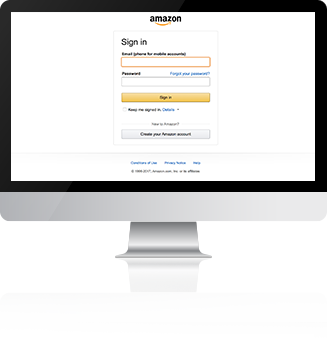 You will receive an email confirmation sent to your registered email addresses with Amazon.com and Citi notifying you each time your card account is successfully linked or de-linked from an Amazon.com account. You will also receive email notifications of any transaction made with your Points/Miles at Amazon.com. Where can I see if my eligible Citi card account is linked to my Amazon.com account? To see if your eligible Citi Card account is linked to your Amazon.com account, visit the Shop with Points page in Your Account at Amazon.com. For the avoidance of doubt, you will not be able to see if your eligible Citi Card account has been linked to any other Amazon.com accounts that are not under your name. How do I de-link my eligible Citi card account from my Amazon.com account? In order to de-link your eligible Citi card account from your Amazon.com account, you will need to go to the Shop with Points page in Your Amazon.com Account. Click "Disable" to de-link your Points/Miles. Is there a fee to use Points/Miles at Amazon.com? There is no fee to use Shop with Points at Amazon.com. How do I Shop with Points using cards issued outside the US? When shopping at Amazon.com with a card issued outside the US, select the amount of Points/Miles you want to use by inputting the US Dollar value in the box labeled "apply rewards points" at checkout. Additionally, when using Shop with Points to make a partial payment, the 'cash' portion of the payment that is charged to your Credit Card will be in USD. Why did I receive an error message when I was trying to enroll? During the enrolment process, the Postal code keyed in should be the same as your Citi Credit Card billing address (postal code). Will my points balance be automatically updated in both my Citi card account and my Amazon.com account once I use points/miles? If you order an eligible item at Amazon.com using points/miles, your points/miles balance in your relevant Citi card account may not reflect your pending orders until the date the order is shipped. Can I use Points/Miles in my Citi card account to pay for a portion of my Shop with Points order at Amazon.com? Items eligible for Shop with Points at Amazon.com can be purchased using your Points/Miles, your eligible Citi credit card linked to Shop with Points at Amazon.com, an Amazon.com gift card, an Amazon Payments Stored Value account or any combination of the above. Are there any products I am unable to buy using Shop with Points at Amazon.com? Amazon.com may restrict the use of points for purchases of certain items at Amazon.com, and these items may change at any time. Items that may not be purchased using Shop with Points at the date of publication include some digital downloads such as music and movies, Kindle downloads, Subscribe and Save items, AmazonLocal items, AmazonFresh purchases, or orders containing Pre-order items. Shop with Points cannot be used on any other Amazon site such as MyHabit.com or Zappos.com. Additionally, you may not use 1-Click to purchase products when placing an order using Shop with Points. Can I return merchandise that I purchased at Amazon.com with my points/miles? Citi ThankYou Rewards is a loyalty program that lets you redeem your Points/Miles* for rewards, including merchandise, travel, vouchers, points transfer and even cash rebates to your Citibank credit card account. *Points refer to the Citi Dollars/Ultima Dollars; and Miles refer to Citi Miles; earned when you make eligible purchases with a Citibank credit card that is enrolled in Citi ThankYou Rewards. Am I eligible to participate in Citi ThankYou Rewards? If you hold one of the following Citibank credit cards, you are automatically enrolled in Citi ThankYou Rewards. Why can't I redeem my available Points or Miles or Rebates? If you close your Citibank credit card account, your Points/Miles Balance will be forfeited immediately. If you have additional questions about your Citibank credit card account, please contact CitiPhone at 62255225. How is my information in Citi ThankYou Rewards connected to my Citibank credit card account? 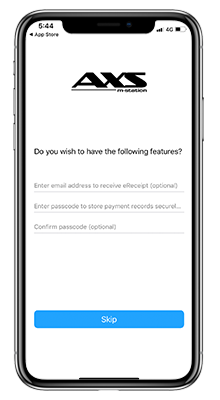 Information in your Citi ThankYou Rewards profile, such as address, email and phone number, comes from the information you provided at account opening. To update any of your personal information, please go to Citibank Online at www.citibank.com.sg or contact CitiPhone at 6225 5225. Where do I find my Points or Miles balance? Once signed on to Citi ThankYou Rewards, go to "Home," then "My Account," and then "Points Balance," or "Miles Balance". How can I redeem my Points or Miles? Based on the applicable Citi ThankYou Rewards features for your card, Points or Miles can be redeemed for a wide range of products and experiences that include merchandise, vouchers, travel, cash rebates, credit card annual fee reversals and even donations to charity. 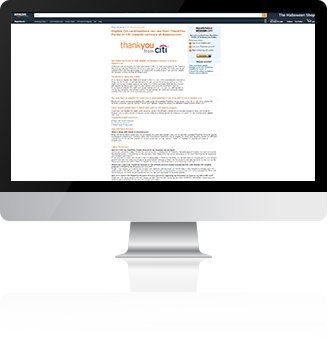 Explore all the options available to you at the Citi ThankYou Rewards site. The homepage presents all of the categories available to you. Simply select the type of reward you're interested in to see what Citi ThankYou Rewards has to offer. Browse by specific Points/Miles ranges, categories, or brands. Use the search tool to find specific items in the collection. Add any desired item to your Wishlist or Shopping Cart. From there, you can place your order. 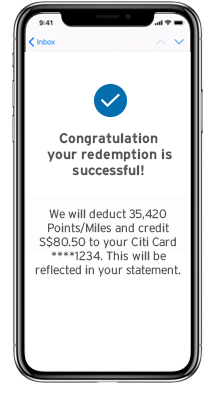 When you redeem Points/Miles for a Cash Rebate, your credit card available balance will be adjusted according to the amount you have redeemed for within two business days, and you can view the statement entry reflected in your account two days after the SMS redemption is made. Cash Rebate is available in predetermined increments. Your account must be open and in good standing in order to be eligible for a Cash Rebate redemption. Cash Rebate cannot be canceled or returned, and is only available for certain Citibank card accounts participating in Citi ThankYou Rewards. To redeem for Annual Card Fees, please contact Citiphone at 6225 5225. Annual Card Fees reversals are available in predetermined amounts based on your Citibank credit card account type. Your account must be open and in good standing in order to be eligible for an annual card fee redemption and cannot be canceled or returned, and is only available for certain Citibank credit card accounts participating in Citi ThankYou Rewards. How long after I make a purchase with my Citibank credit card will it take for my Points or Miles to appear in my Points or Miles balance? Points or Miles received on eligible new purchases will appear in your Points balance within 24 hours of being posted to your Citibank credit card account. Special bonus Points/Miles may take 1 to 2 additional billing cycles to appear (approximately 30-60 days). Do Points or Miles expire? For Gold, Platinum, Visa Signature and WORLD MasterCard cardmembers (excluding Business/ Corporate Gold cardmembers), Points are valid for a period of 60 Months. For Citi Prestige Card, Citi Ultima Card, Citi PremierMiles Card, Points and Miles do not expire. For all other cards, Points are valid for a period of 12 Months. *Points refer to the Citi Dollars/Ultima Dollars; Miles refer to Citi Miles; earned when you make eligible purchases with a Citibank credit card that is enrolled in Citi ThankYou Rewards. What does Adjusted/Forfeit/Redeemed Points/Miles mean? Redeemed points are the Points/Miles you have already used to redeem for rewards and have been subtracted from your Points Balance. Adjusted Points/Miles will appear in your Points/Miles Balance following a resolution in the rare case that you make a return, or have a problem with a reward you received, or if there was a mistake in the way your Points were calculated/awarded. Forfeited Points/Miles will no longer be available for redemption in instances where the Citibank credit card account tied to Citi ThankYou Rewards has been closed at your request, or canceled by Citibank due to delinquency, before such Points/Miles were redeemed. Your order history is located under the My Account section. In Process: Your order has been placed. Order Accepted: Your order was accepted and sent to the supplier. Shipped: Your order was shipped from the supplier. Cancelled: Your order has been cancelled or rejected by Citi ThankYou Rewards. Returned: Your order has been returned. Are there additional charges when I make a redemption via a CitiPhone agent? Yes, 600 Point/Miles will be charged for each item (merchandise/vouchers/cash rebate) redeemed through Citiphone. This 600 Points/Miles will not be charged if redemption is made via the Citi ThankYou Rewards Program redemption website. Are there any delivery costs for merchandise rewards? Generally, standard delivery and handling costs are included in the total cost in Points of your reward. The total number of Points/Miles required for redemption will be displayed during the checkout process. If the item is procured from the United States, the cost of the international shipping in Points/Miles will be detailed separately at checkout. How are the rewards sent to me? Merchandise rewards and vouchers are sent via normal post. Items sent from the United States will be delivered via common courier. For charity, cash rebates and other rewards that don't need to be shipped, you will be notified during checkout when you or the designated charity will receive the reward. If my reward needs to be sent, when will it be delivered? Delivery times for items shipped from the United States vary by product and supplier. Estimated time for most items to be sent out from the supplier will be 5 to 7 business days from the time you redeemed for the item, and may take up to 2-4 weeks to reach you. If your item does not ship within 7 days from when the order is placed, we will notify you via email. Rewards Vouchers shipped from Singapore will be sent via normal post to you within 5-7 business days. Can I send my rewards to an address other than my billing address? No, all rewards can only be sent to your card billing address. How long are my reward vouchers valid for? All Citibank reward vouchers are valid for a period of 3 months unless otherwise specified. What do I need to do to collect my Rewards? You will need fill in your credit card number and sign on your Citibank Reward voucher before presenting it at the respective shop or redemption outlet to claim your reward. Any incomplete Reward Vouchers will not be accepted. Where can I collect my Rewards? Your Citibank Rewards can be collected at the venue specified either on our Online Rewards Catalog or on the Citibank Voucher itself. Can I cancel my redemption? Once submitted, all redemptions are final and may not be cancelled. If a merchandise reward is damaged when you receive it, please call CitiPhone within 5 days to report the damage and organize a return of the merchandise reward. Do the merchandise rewards have warranties? Products and services will carry their manufacturer's warranty.We give no warranty with respect to rewards and furthermore are not responsible for the fulfilment of warranties. How can I use my points/miles to redeem instantly for flights/hotels? You can access the travel center via Citi ThankYou Rewards. Once logged in, go to "Travel" to redeem for airline tickets, hotel accommodations, car rentals, cruises, travel packages and destination activities/excursions. The travel service provider for Citi ThankYou Rewards is Connexions Loyalty Travel Solutions LLC. The travel rewards offered by Citi ThankYou Rewards are fulfilled by Connexions. Points Transfer is a feature that allows you to easily transfer your Points or Miles to participating travel loyalty programs. From airlines to hotels, Points Transfer gives an added dimension of value and flexibility to your Points or Miles. 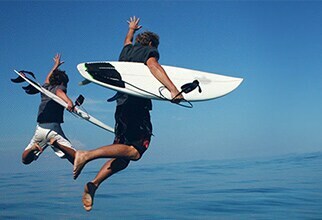 There is a wide range of participating travel loyalty programs within Citi ThankYou Rewards. Sign on to Citi ThankYou Rewards and select "Travel" then "Points Transfer" to see the current participating travel loyalty programs available to you. How can I transfer Points or Miles? Select the participating travel loyalty program you want to transfer Points or Miles to. Select the number of Points or Miles you want to transfer. Can Points Transfer requests be canceled? No. Points Transfer requests cannot be cancelled or reversed. Once your Points Transfer redemption is submitted, the Points may not be converted or transferred back. Do the Points or Miles that I transfer expire, have out dates, or any other restrictions? The Points that you transfer become subject to the terms and conditions of the applicable participating travel loyalty program that you transferred your Points or Miles to. Once transferred, please check with the applicable participating travel loyalty program for more details. Are there any restrictions on the amount of Points or number of times I can transfer Points? There may be specific minimum thresholds for individual participating travel loyalty programs. Sign on to Citi ThankYou Rewards to see the current minimum Points Transfer requirements by participating travel loyalty program by clicking on "Points Transfer". Is there a fee to transfer Points? Yes, there is a Points Transfer fee of S$25 per redemption. Citi Ultima cardmembers will not be charged a Points Transfer fee. When will my Points be posted to my loyalty program member account after I complete a transfer? Points will be posted to the applicable participating travel loyalty program within 5-7 days, except for Etihad Guest and Thai Airways Royal Orchid Plus, which will be posted within 14 business days. Can Points be transferred to a participating travel loyalty program account that is not under my name? No. The first and last names on both your Citibank credit card account and the participating travel loyalty program account must match in order to complete a Points Transfer redemption. What types of travel can I redeem my Points or Miles for? Travel includes airline tickets, hotel accommodations, car rentals, cruises, travel packages and destination activities/excursions. The travel service provider for Citi ThankYou Rewards is Connexions Loyalty Travel Solutions LLC. The travel rewards offered by Citi ThankYou Rewards are fulfilled by Connexions. How do I use my Points or Miles to book travel? Travel Reward reservations must be made through the CitiPhone or online at Citi ThankYou Rewards. To book online click on the Book Travel tab at the top menu of the site. All Travel Rewards are subject to availability and restrictions of the relevant travel supplier. Why did the number of Points or Miles required for my travel search change within minutes while I was processing my redemption? Travel pricing in Points or Miles is quoted through a real-time system. Pricing and availability cannot be guaranteed until the redemption is completed. Since many other agencies and airlines are pulling from the same inventory, changes to availability and price can be frequent. Are there restrictions or out dates for travel redemptions? No, there are no out dates. This means you have the freedom to travel anytime of the year - even during the holidays, as long as there is availability presented to you when you conduct your search. There are no out dates. Taxes, fees and surcharges are included in the number of Points required and are subject to change without notice. Flights may be non-stop, direct, or involve a change of planes. They may also be one-way flights. Flights do not have to be exact roundtrips. Flights into and out of different airports are permitted. Airline, hotel, car rental, travel package, cruise and activity/excursion company participation may vary from market to market. Travel must be completed by the expiration date indicated on the travel document. Travel reward reservations cannot be separated. A booking fee may be charged when a customer redeems online or via the travel call centre. All reservations must be made outside of 24 hours prior to departure. Reservations cannot be accepted within 24 hours of departure. Are taxes and surcharges included in the Points total or Miles total for travel redemptions? Taxes, tax charges, and/or surcharges are included. Luggage fees and other incidental fees are not included. May I add a traveler to my itinerary? Yes, you can use your Points or Miles to redeem for a travel redemption for someone other than yourself. Once an itinerary is confirmed and booked, additional travelers will require separate itineraries. Reservations not made on the same itinerary are subject to availability and Point or Miles price levels at time of booking. Travel may not be booked online for minors traveling unaccompanied by an adult. Please contact CitiPhone for assistance with unaccompanied passengers under 18 years old. All airline-imposed unaccompanied minor fees apply and will be at your expense. All travel redemptions must be made at least 24 hours prior to departure. What if I need to cancel my travel reservation? Please contact CitiPhone to edit or cancel a travel reservation. There may be a penalty or change fee for travel reservation edits or cancellations. The travel representative will advise you of all fees for changes or cancellations when you call to edit or cancel your reservation. What if I don't have enough Points for the trip I want? You have the option of paying for part of your trip with Points and the remaining balance with your Citibank credit card. Can I combine my Points with frequent flyer miles for air travel? No. Unfortunately, you can't combine Frequent Flyer Miles with Points to complete a travel redemptions. Will I receive a ticket in the mail for my travel reward redemption? Airlines tickets will be issued as e-tickets unless paper tickets are required by the airline. For travel redemptions made online at Citi ThankYou Rewards, electronic confirmation and documentation will be sent to the email address displayed at checkout. If paper tickets are required they will be sent via a traceable carrier. For other travel rewards such as travel and cruise packages, travel documents will be sent to the address provided at checkout. What if I have specific questions related to my upcoming travel booking? For any specific questions regarding seat assignments, meal options, or specific requirements or information about travel please contact the airline, hotel or car rental agency you have booked with directly. If you need to edit or cancel your reservations please contact CitiPhone. Are there additional charges when I book via a Phone agent? For any flight booked via a phone agent, a fee of S$25 per flight itinerary is applicable. This fee will not be charged if redemption is made via the Citi ThankYou Rewards Program redemption website. Points refer to the Points earned on Citi Classic, Citi Gold, Citi Visa Platinum, Citi Rewards and Citi Prestige credit cards or the Ultima Dollars earned on Citi ULTIMA credit cards. 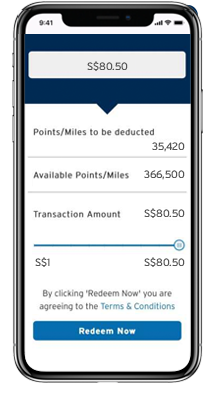 Miles refer to the Citi Miles earned on Citi PremierMiles credit cards. Citi PremierMiles American Express Credit Card will not be eligible for Citi Instant Rewards. Rebates refer to the Citi Rebates earned on Citi M1 Cards only and will eligible for Pay with Points via SMS only. Citi Rebates earned on all other credit cards will not be eligible for Pay with Points via SMS or any other redemption products. 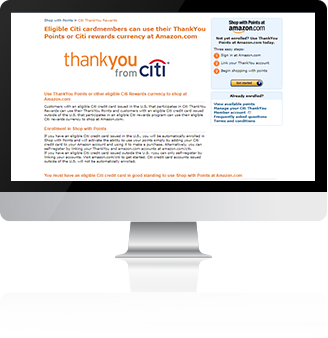 Citi ThankYou℠ Rewards Program Terms and Conditions Apply. Visit here for details. Shop for your personal healthcare products at the following stores and pay with your points or miles. Shop for your sundries at the following convenience stores and pay with your points or miles. Dining refers to Spends at Restaurants with merchant category codes 5812 & 5814. Shop for your groceries at the following supermarket/online store and pay with your points or miles.